As a departure from folk music and heavier rock, the 1970s boogies toward Disco and a faster beat. The Bee Gees, Donna Summer, Abba and others defined an era of music that featured soaring, often reverberated vocals, over steady four on the floor beat. 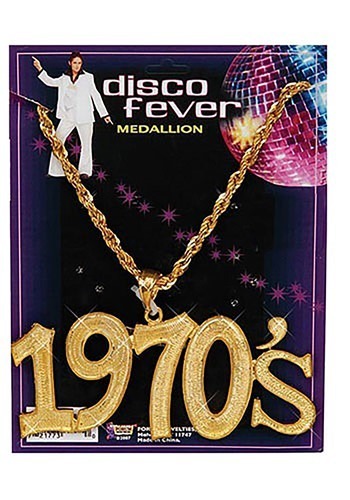 1970s costumes reflected this dance club attitude with slinky halter dresses and platform sandals for the ladies and polyester pants and unbuttoned silk shirts for the men. You’ll be staying alive in a 1970scostume from the movie “ Saturday Night Fever”. A black shag wig and white polyester suit with gold chains around the neck will attract all the chicks. For big laughs, partially unbutton your shirt and let a “chest wig” sprout out. A dance dress in the style of Halston or Diane Von Furstenberg will make quite an entrance at Studio 54, an infamous disco club in New York City. 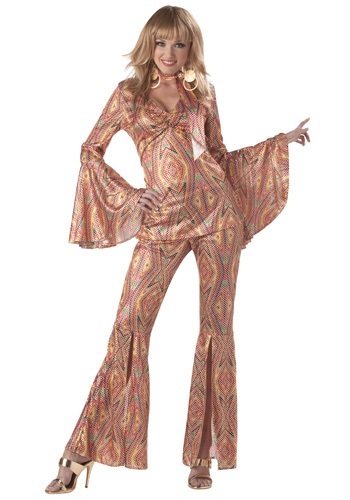 Silky, sequined materials with ruffles and handkerchief hemlines will show off your boogie wonderland, Seventies style. Add a wild afro wig to your 1970s costume or even a long, ironed-straight wig a la Cher.